We consider our workforce to be our most important asset. Our company values underpin our working philosophy and guide our behaviours and we strive to ensure a fun working environment where our staff can flourish and prosper. hotelshopUK conducts its business in accordance with policies and procedures which are detailed in our Staff Handbook and in our ISO 9001:2008 documentation. We have an on-going commitment to improving working and ethical standards. We recognise the exceptional actions of staff members via a Hero of The Month award and Employee of the Year award. 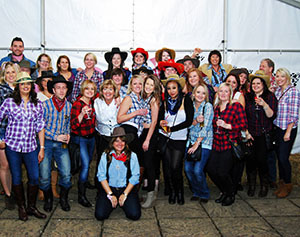 We hold regular FUN staff events – from our Cowboy themed Christmas party (complete with Bucking Bronco) to the summer's annual outdoor bash at MD Viv Findlay’s house. We work hard to develop our team – not only with their careers but with their personal development. We have a generous staff benefits package. We communicate regularly through our weekly MD update and informal feedback sessions with the MD. AND we conduct an annual staff survey to find out how we are doing – AND make changes as a result of that feedback.